Whether you’re onboarding new customers, cross- or up-selling, getting your supply chain or logistics right, or even collecting unpaid debt, making the best choice of decisions means weighing not just what’s right for your department – but what is best for the business overall. Not to mention what is optimal for your customers and partners. And let’s face it, even with the availability of business intelligence and other analytic tools, it’s hard to know what constitutes the right actions to take in an era where Big Data consistently throws you curveballs. 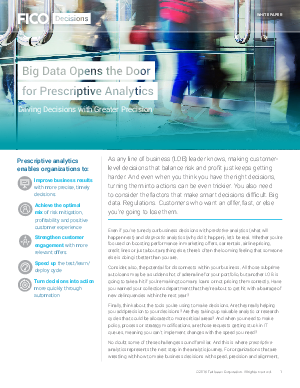 Prescriptive Analytics can help – but for most organizations, there are more questions and concerns than answers about how to implement it successfully.